The Adams Forward Bend Test is the simplest and most commonly used scoliosis evaluation technique. The method is easy to learn and highly accurate in identifying people who might demonstrate atypical side to side curvatures of the vertebral column. Most school-aged children will have this test performed on them yearly as part of their general health evaluation by the school nurse or doctor. The Adams Test is not a true diagnostic tool. It simply helps to narrow down people who might be expressing scoliosis, but the test is not foolproof. Many people are flagged with positive results, but are eventually cleared of having scoliosis. Meanwhile, some people pass the Adams Test just fine, but actually do have scoliotic formations in their spines. This discussion examines the use of The Adams Bending Test for the preliminary identification of possible scoliosis patients. We will detail how to achieve the best results from the test, as well as what problems can occur that might create poor observations and outcomes. The Adams Scoliosis evaluation technique is very simple. First, the observer will examine the subject’s posture in a normal standing position. They will look for any of the classic signs of scoliosis, including uneven shoulder height or forward projection, uneven hip height or forward projection or any anatomical distortions during relaxed standing posture. Next, the subject will be asked to expose their back and bend forward at the waist as far as possible or to approximately 90 degrees. The observer will stand behind and to either side of the subject and examine their spine from several perspectives. Since the spine will be pulled tightly in this position, curvatures will be rather obvious, especially in thin to average build individuals. The observer will once again look for any side to side curvatures in the vertebral column or signs of scoliosis including shoulder, neck or hip postural or positioning abnormalities. The observer will also look for any humps or indentations in the surface of the back when the subject bends, as these can also be signs of scoliosis, as well as atypical kyphosis. After full observation is complete in a matter of a few seconds, the subject will be told to return to an upright position and get dressed to finish the exam. The greatest benefit of the Adams Forward Bend Scoliosis Test is that it can easily be learned and performed by virtually anyone. The test is fast and highly effective in identifying people who may be affected by abnormal spinal curvatures, including scoliosis. The Adams Test is noninvasive, does not require any equipment (although a scoliometer is helpful for evaluating individuals who demonstrate signs of curvature) and demonstrates no risks, other then failure to identify people with scoliosis or the possibility of producing false positive results. A typical observer can evaluate many subjects in a short time span, making the test time and cost effective when used in school settings. On the downside, the Adams Test definitely has some shortcomings to contend with, as well. First, the test is less accurate in obese people. Since obesity has reached epidemic levels in many countries, the value of the test has been degraded year over year and more subjects’ anatomies really do not lend themselves to accurate screening. Some subjects can not bend forward at the waist or can not bend far enough to give the test real value. Next, when screening does not produce any suspicion of scoliosis, the subject will not investigate further, leading them to potentially develop a progressing case of scoliosis until they finally register a positive test and are sent to a physician for diagnosis. Finally, many subjects, (including myself, several times) register false positive results, particularly when they demonstrate atypical posture or very minor curvatures. This can lead to anxiety and nocebo effect, as well as the chance for opportunistic, financially-motivated care providers to prey on them, despite them NOT having scoliosis (such as the unethical and dishonest treatment I received from my first chiropractor). Be sure to evaluate the subject before they bend just as carefully as when they do actually bend forward. Normal standing posture is equally important to recognize potential signs of scoliosis. When examining the bent subject, try a variety of angles and heights of visualization for a complete picture of the region from several perspectives. 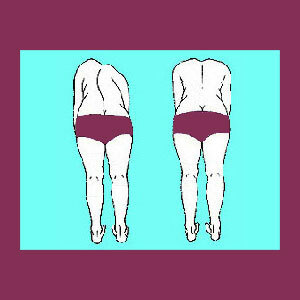 Be certain to understand the difference between common postural habits and the signs of scoliosis. Sometimes, these 2 very different anatomical behaviors can look strikingly similar. Remember that many young people tend to slouch and stand unevenly. When the subject bends forward, do not allow them to support themselves by placing their hands on their knees. If they are very flexible, ask them not to touch the floor when they bend. Both of these actions can change relative shoulder positioning and create false positive results. When the subject bends forward, tell them not to twist their neck to look at the observer. 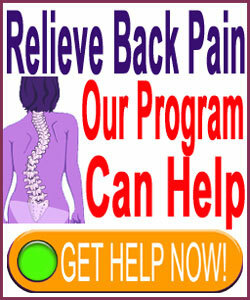 This can distort the spine, creating false positive results. If the subject’s spine is difficult to observe, ask them to round their shoulders slightly forward, making their chest concave. This is particularly helpful in obese subjects and those who simply have less prominent spinal processes.